Bismuth is a poor metal that is twice as abundant as gold, and is produced as a byproduct when processing other metals ores such as lead and tungsten. China is the world's largest producer. 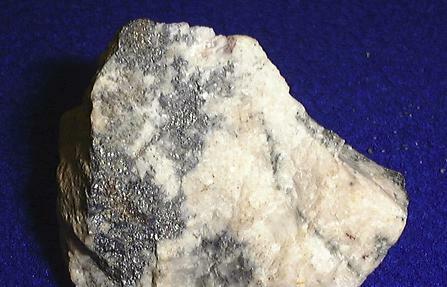 It is radiogenic, formed by the decay of uranium and thorium. It has a wide variety of applications, from cosmetics to alloys to propellants. The estimated domestic consumption breakdown for bismuth for 2009 was: 60% for chemical and pharmaceutical uses; 36% for metallurgical additives for casting and galvanizing; and 4% for bismuth alloys, fusible alloys, solder and ammunition. In recent years, new uses for bismuth as a nontoxic substitute for lead have been developed. These include the use of bismuth in shot for water fowl hunting, lubricating greases, pigments, and solders. World refinery production of bismuth was 15,000 tons in 2009. China was the world’s leading producer of refined bismuth with 80% of the world total, followed by Mexico with 6%, and Belgium with 5%. Domestic Production and Use: The United States ceased production of primary refined bismuth in 1997 and is thus highly import dependent for its supply. A small amount of bismuth is recycled by some domestic firms. Bismuth is contained in some lead ores mined domestically, but the bismuth-containing residues are not processed domestically and may be exported. The value of reported consumption of bismuth was approximately $19 million. About 60% of the bismuth was used in pharmaceuticals and chemicals, 36% in metallurgical additives, and 4% in fusible alloys, solders, and ammunition cartridges. The Safe Drinking Water Act Amendment of 1996 required that all new and repaired fixtures and pipes for potable water supply be lead free after August 1998. As a result, that opened a wider market for bismuth as a metallurgical additive to lead-free pipes. Bismuth use in water meters and fixtures is one particular application that has increased in recent years. An application with major growth potential is the use of zinc-bismuth alloys to achieve thinner and more uniform galvanization. Bismuth was also used domestically in the manufacture of ceramic glazes, crystal ware, and pigments; as an additive to free-machining steels; and as an additive to malleable iron castings. Recycling: All types of bismuth-containing new and old alloy scrap were recycled and contributed about 10% of U.S. bismuth consumption, or 100 tons. Import Sources (2006–09): Belgium, 33%; China, 31%; United Kingdom, 17%; Mexico, 11%; and other, 8%. Events, Trends, and Issues: Owing to its unique properties, bismuth has a wide variety of applications, including use in free-machining steels, brass, pigments, and solders, as a nontoxic replacement for lead; in pharmaceuticals, including bismuth subsalicylate, the active ingredient in over-the-counter stomach remedies; in the foundry industry, as an additive to enhance metallurgical quality; in the construction field, as a triggering mechanism for fire sprinklers; and in holding devices for grinding optical lenses. Currently, researchers in the European Union, Japan, and the United States are investigating the possibilities of using bismuth in lead-free solders. Researchers are examining liquid lead-bismuth coolants for use in nuclear reactors. Work is proceeding toward developing a bismuth-containing metal-polymer bullet. The price of bismuth started 2010 at $7.65 per pound and rose slightly throughout the year, ending August at $8.40 per pound. The estimated average price of bismuth for 2010 was about 7% above that for 2009. Industry analysts attributed the higher price to increased world demand. In Canada, an exploration firm announced further progress with the analysis and development of its cobalt-gold-bismuth deposit in Northwest Territories. Another Canadian exploration company reported additional advancements to develop its bismuth-fluorspar-tungsten property in Vietnam. World Resources: Bismuth, at an estimated 8 parts per billion by weight, is the 69th element in order of abundance in the Earth’s crust and is about twice as abundant as gold. World reserves of bismuth are usually based on bismuth content of lead resources because bismuth production is most often a byproduct of processing lead ores; in China, bismuth production is a byproduct of tungsten and other metal ore processing. Bismuth minerals rarely occur in sufficient quantities to be mined as principal products; the Tasna Mine in Bolivia and a mine in China are the only mines that produced bismuth from a bismuth ore. The Tasna Mine had been on standby status since the mid-1990s awaiting a significant and sustained rise in the metal price, and in late 2008 there were reports that it had reopened. Several bismuth-containing deposits are in varying stages of mining feasibility review. These polymetallic deposits include Bonfim in Brazil, NICO in Canada, and Nui Phao in Vietnam. Substitutes: Bismuth can be replaced in pharmaceutical applications by alumina, antibiotics, and magnesia. Titanium dioxide-coated mica flakes and fish scale extracts are substitutes in pigment uses. Indium can replace bismuth in low-temperature solders. Resins can replace bismuth alloys for holding metal shapes during machining, and glycerine-filled glass bulbs can replace bismuth alloys in triggering devices for fire sprinklers. Free-machining alloys can contain lead, selenium, or tellurium as a replacement for bismuth. Bismuth, on the other hand, is an environmentally friendly substitute for lead in plumbing and many other applications, including fishing weights, hunting ammunition, lubricating greases, and soldering alloys. Teck Cominco (NYSE: TCK) - Their specialty metals division produces bismuth, cadmium, germanium, and indium. Hunan Shizhuyuan Nonferrous Metals Co. Ltd. - The largest producer of bismuth in China. Romios Gold Resources (CVE: RG) - http://www.romios.com/ - Bismuth, lithium, molybdenum, and silver deposits at their La Corne property near Val d'Or, Quebec. American Elements - http://www.americanelements.com/be.html - Bismuth metal, bismuth fluoride, bismuth iodide, bismuth nitrate, bismuth oxide, bismuth oxychloride, bismuth oxynitrate, bismuth selenide, and bismuth telluride. 2008-10-06 - (pr) - American Elements announces expanded bismuth production to meet demand for lead free bullets.